Struck with a love and talent for music at an early age, Acethetic began DJing, producing, and rhyming in the late 90's. "Hip-Hop was always in my blood," says Ace. "Conscious lyrics and a beat that hit hard always hit home." Also being inspired by artists like James Brown, Miles Davis, and John Coltrane, Ace began studying Jazz, playing the guitar, and developing his own sound. Born in San Diego, CA, Ace emerged in the Underground Hip-Hop scene in 2003 with his debut album Park Benches. 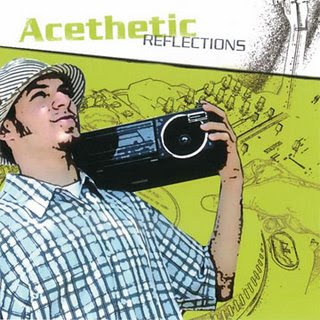 In 2006, Acethetic joined forces with a live band to perform at the Epicentre in San Diego for the release of his latest CD "Reflections". Today, Acethetic resides in the Bay Area and performs regularly. He incorporates elements of Jazz with smooth basslines, heavy hitting drums, and rhythmatic cuts to produce a sound all his own. "A true artist must remain open-minded," says Ace. "I try to continue to learn and grow while expressing my true emotion, thoughts, and soul." His eclectic beats and conscious lyrics combined with elements of Funk, Jazz, Soul, and whatever else he decides to toss into the gumbo, makes his songs all the more fresher. Cop This! !